^ Design Classics-The London Underground Map. BBC Four. ^ 3.0 3.1 賽門·加菲爾（英语：Simon Garfield）. 地圖的歷史：從石刻地圖到Google Maps，重新看待世界的方式. 鄭郁欣譯. 馬可孛羅文化. 2014. ISBN 978-986-6319-96-9. ^ Visions of Earth. National Geographic. July 2008: 30. ^ 6.0 6.1 6.2 Harry Beck and London's iconic tube map. Time Out London. 17 April 2007 [1 April 2014]. ^ 7.0 7.1 1931 Underground Map by Harry Beck Poster. London Transport Museum Online Shop. [1 April 2014]. ^ 8.0 8.1 Amar Toor. 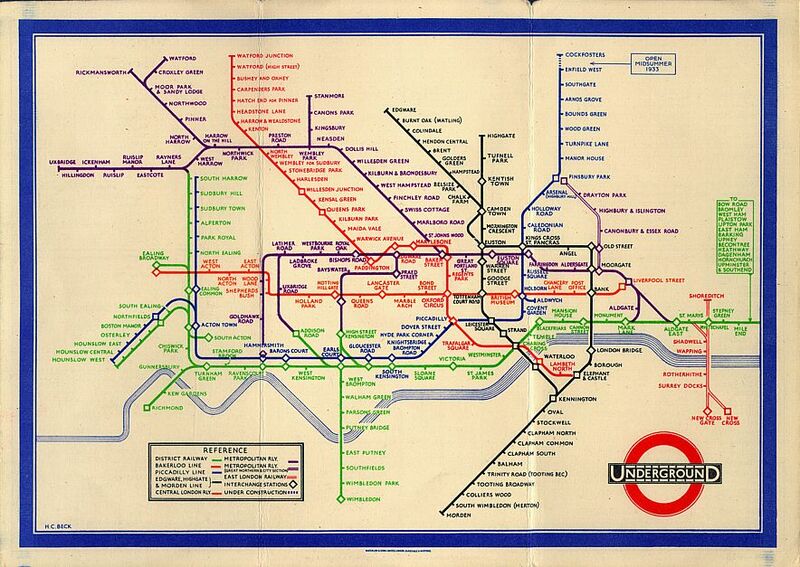 Meet Harry Beck, the genius behind London's iconic subway map. The Verge. 29 March 2013 [2 April 2014]. ^ 9.0 9.1 London's Tube map creator Harry Beck gets blue plaque. BBC News. 25 March 2013 [1 April 2014]. ^ 10.0 10.1 Ken Garland（英语：Ken Garland）. Mr Beck's Underground Map. Harrow Weald, Middlesex: Capital Transport, 1994. ISBN 1-85414-168-6. ^ "Concorde beats Tube map by a nose in UK design vote" 互联网档案馆的存檔，存档日期2011-06-27. (20 March 2006) at the Transport for London website. ^ 2009 Stamps Commemorate 10 Iconic British Designs. InventorSpot.com. ^ Harry Beck Tube Designer Honoured - Blue Plaque. The Guardian. 25 March 2013 [23 November 2013]. Leboff, B. and Demuth, T. No need to ask! Early Maps of London's Underground Railways, Harrow Weald, Middlesex: Capital Transport. 1999, ISBN 1-85414-215-1. "The Story of Beck's London Underground Map"